Sometimes in my genealogical journeys, I run across a document that I have never seen before. I recently discovered a very unique document in my research on the Prasse Family of Cleveland, Ohio. These records were described as Bible records but when they finally arrived, I learned that this was a slight misnomer. 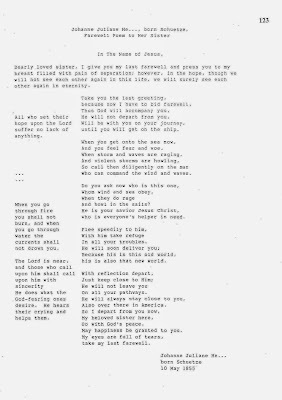 What I actually received was an original baptismal record for Emil Prasse from a German language church in Cleveland and a farewell poem from Emil's maternal aunt that remained behind in Germany. 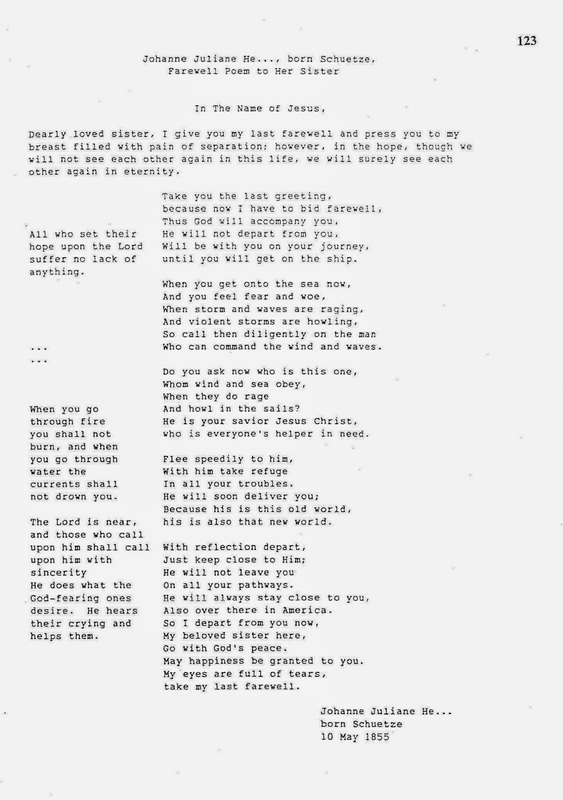 The farewell poem was one of the most mystifying documents that I had ever read. 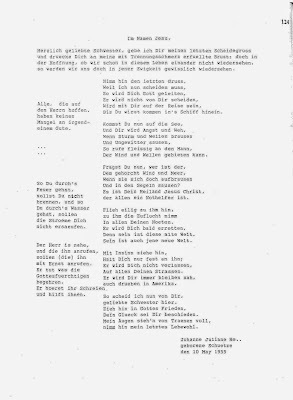 The document was transcribed from the original German and then translated to English. But when I looked at the date at the bottom of the poem, 10 May 1855, I realized that this eulogy was written prior to the departure of the Prasse family from Germany. It was mournful because Aunt Johanne knew that she would never see her sister again. Who can command the wind and waves. And howl in the sails? who is everyone's helper in need. his is also that new world. Also over there in America. May happiness be granted to you. This poem is such a treasure, and I am so glad that it was preserved in this fashion. The poem is also a great example of a genealogical treasure with no provenance. The Genealogical Committee of the Western Reserve Historical Society had failed to cite the source of this document. Even worse it appears that someone had the original image from which a transcription was made but they were unable to make out Aunt Johanne's married name. The original image was also not included in the publication. Tribute to her sister Christianne Elizabeth Schuetze Prasse. 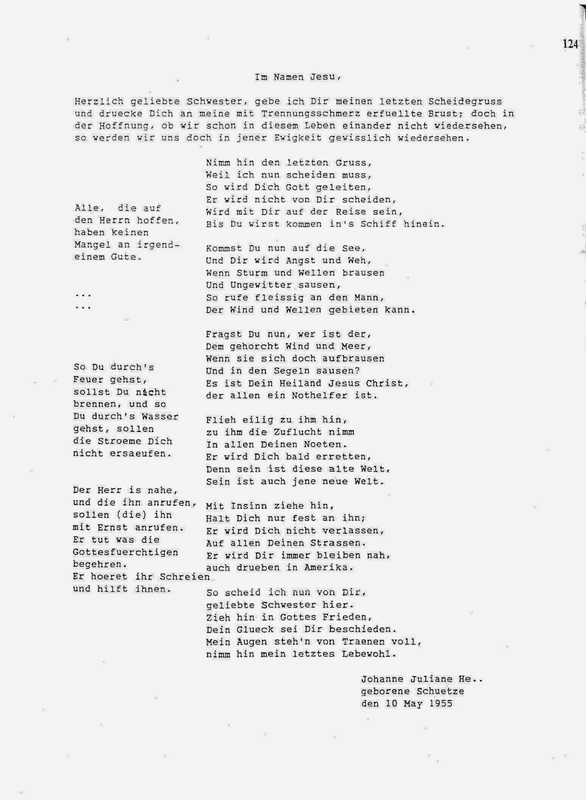 Transcription in German and English. AND,,, drum roll please...a phone number...... 440-331-6713. AND...of course the number is no longer in service. Horrors!!! I may actually have to write a snail mail letter with a self addressed stamped envelope. It appears from this description that the original hand written poem may not have been submitted to the WRHS. These two records when read together reveal a great deal about the Prasse family. 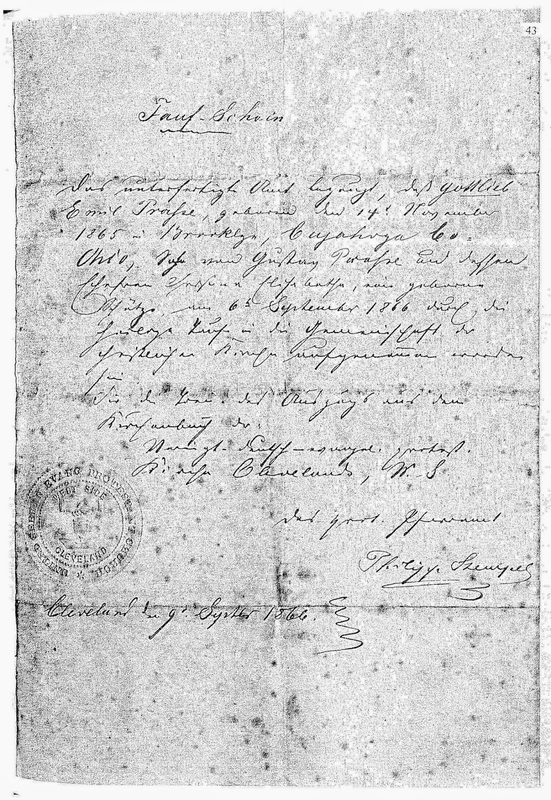 Here is the original image of the baptismal record. The undersigned book certifies that Gottlieb Emil Prasse, born on 14th November 1865 in Brooklyn, Cuyahoga Co., Ohio, son of Gustav Prasse and his wife Christianna Elisabethe, who was born Schuetze, was on the 6th September 1866 admitted through Christian Baptism into the congregation of the Christian Church. From the Protestant minister’s office, signed Philippe Stempell, Cleveland, the 9th September 1866. I have written before about this church which is now known as the Westside United Church of Christ, 3800 Bridge Ave, Cleveland, OH 44113. 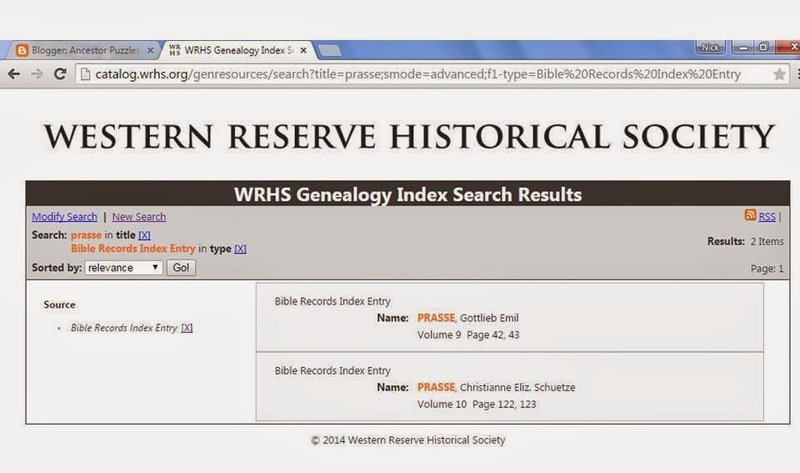 The church still holds its original records which apparently have not been microfilmed. 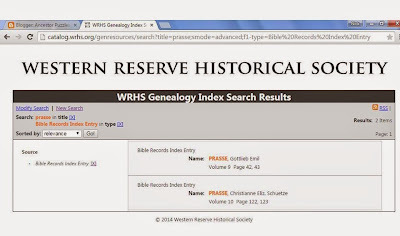 I have made a written request for a search of their records related to the Prasse family. It appears that there may be several baptisms, marriages and burials of Prasse family members recorded in the books of this church. The farewell poem and the baptismal certificate reveal several clues about the Prasse family. Together the two documents confirm that Christianna Prasse's maiden name was Schuetze. Christianna's sister was deeply religious so it seems likely that both sisters shared a Protestant faith that was instilled by their parents. It appears that they may have been dissenters from the established Lutheran church of Germany as the United German Evangelical Protestant Church of Cleveland was a decidedly different brand of religion. Clearly the Prasse family departed from Germany shortly after the date of 10 May 1855 on the poem. But mostly I am struck by the mournful words of Aunt Johanne's poem. The incredible pain and loss that she felt upon the departure of her sister from Germany to America. She took some consolation in her faith that she would meet her sister again in heaven. The fact that her poem was preserved by the WRHS has made it possible for all of the Schuetze and Prasse descendants to experience the joy of that reunion here on earth. I would especially like to thank Dieter Gaupp for his work on the translation of the baptismal record. German Ancestors Part 3- Lost in Translation? Assassin of Bob Sloan Convicted!